Cheep’s in New York City offers everything in a pita, bursting at the seams and swaddled in tinfoil. For 2 measly dollars: an entire circle of first-rate pita, 6-ish fresh, hot falafel balls, pickled red cabbage, pickles, shredded lettuce, carrots cooked in spicy sauce, white sauce, hummus, and hot sauce. 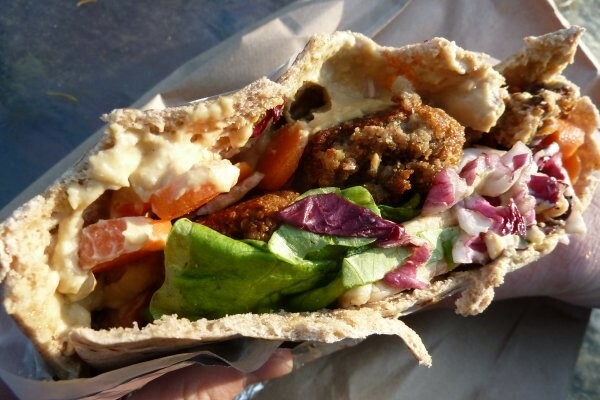 It is bigger and better than any felafel in New York City, and I’ve tried them all. While you sit outside in front of the neon sign that makes the tiny joint hard to miss (find it here! ), you can bask in the heat of the scintillating space-heater that cooks the gyros. Yes, it’s fast food. If that makes you recoil, please bear with me while I make a case for fast food, hipster-style. Don’t you think that fast food gets kind of a bad reputation? Yes, it is often deserved—it does give you all sorts of health problems, from the immediate (nausea) to the long-term (myocardial infarction). But I think idealistic, organic eaters should come to terms with the fact that nothing makes you burp in blissful satisfaction like a burger; fast food has earned its popularity by being as often delicious as it is disgusting. Hipsters embrace things that the mainstream considers not in good taste, but have a certain base appeal. For example: flannel, paired with traffic-stopping shades of orange—jarring to most, but admittedly cozy. Ungroomed facial hair—smelly, yet appealing in a primal way. Clunky boots—functionally awkward, though simultaneously cute to the rough-and-tumble. So now that consumerism, abhorred by hipsters, is sinking its teeth into the healthy food industry, I think hipsters will spitefully flock to fast food, not only because it is counter-culture, but also because it has an elemental appeal. Also? It’s cheap. You heard it here first. Humans crave grease, dating back to when fats were crucial to our survival in cold weather. So maybe it’s my Minnesotan side, but I’d like to spend a moment celebrating this greasy gem on the lower east side of Manhattan. I’ll leave you with the age-old joke: Why did the hipster burn his tongue? Sarah Trautman is a Junior English major at Carleton College in Minnesota. After studying Ulysses in Ireland she learned that everything makes more sense alongside a pint of Guinness, except Irish accents, which become less comprehensible but more endearing. Great article Sarah. Makes me want to eat street food 24/7. (and thanks for using endearing in your bio) However, I’m still not sure it’ll beat our downstairs Falafal joint over seas. i’m actually wearing my favorite flannel shirt right now! Yum! I want one now. Too bad it’s a little far away. I would go to New York for this $2 wonder! I soooo wanted one from this description! I don’t know how you managed to “tastefully” work facial hair into a food review (and still make me pine for the cheep, greasy, super delicious sounding felafel sarni)but it worked and I’m still laughing. This one’s got legs! Hipster or hipstah? Either way, you’ve made a case for fast local food. I cannot bring myself to enjoy a Burger King hamburger, but fast, local street food is well, hip and tasty.